German rabbi; born at Zülz, Prussian Silesia, March 24, 1822; died in Breslau Sept. 22, 1902. He was a grandson of Rabbi Meshullam Solomon Cohn of Fürth. Solomon Cohn attended the yeshibah at Presburg for a short time, and then the gymnasium and university at Breslau. At the latter institution he studied Oriental languages and philosophy, and received the degree of Ph.D. In 1847 Cohn was called as rabbi to Oppeln, then to Maestricht, Schwerin, and in 1876 to Berlin; he retired in 1894 to Breslau. 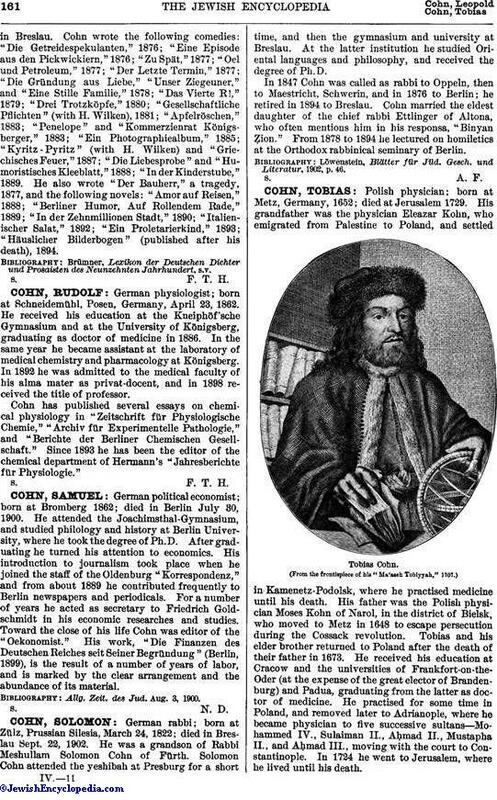 Cohn married the eldest daughter of the chief rabbi Ettlinger of Altona, who often mentions him in his responsa, "Binyan Ẓion." From 1878 to 1894 he lectured on homiletics at the Orthodox rabbinical seminary of Berlin. Löwenstein, Blätter für Jüd. Gesch. und Literatur, 1902, p. 46.